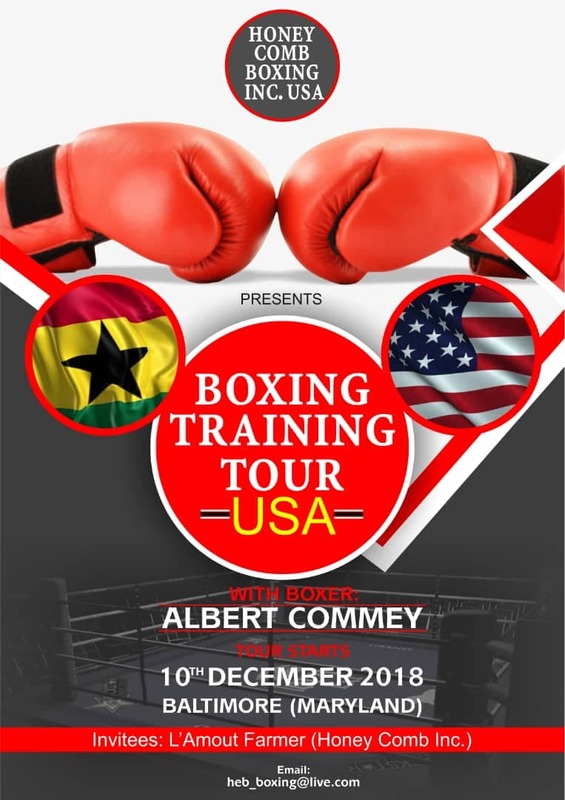 Ghanaian Bantamweight fighter Albert Commey is set to embark on a traning tour to the United States of America from 10th December, 2018. As part of the tour Albert Commey and his management team will be visiting Maryland, Bronx, Brooklyn and a few other states. The boxer is expected to travel with his manager Prince Tweneboah and trainer Wahidu Mohammed who will be with him throughout his six weeks stay for a professional boxing training session at the Honey Comb Boxing Inc. In a letter sighted by Ghanadatabase.com the trainer of the tour in the United States of America, Lamout Farmer stated that he represents Honey Comb Boxing Inc, therefore they will cover all expenses of their tour which includes accommodation, return air ticket and any other expenses incurred pertaining to the training. According to Albert Commey’s manager Mr Price Tweneboah, he is preparing for a Bantamweight title which will be arranged by his Camp after the training.